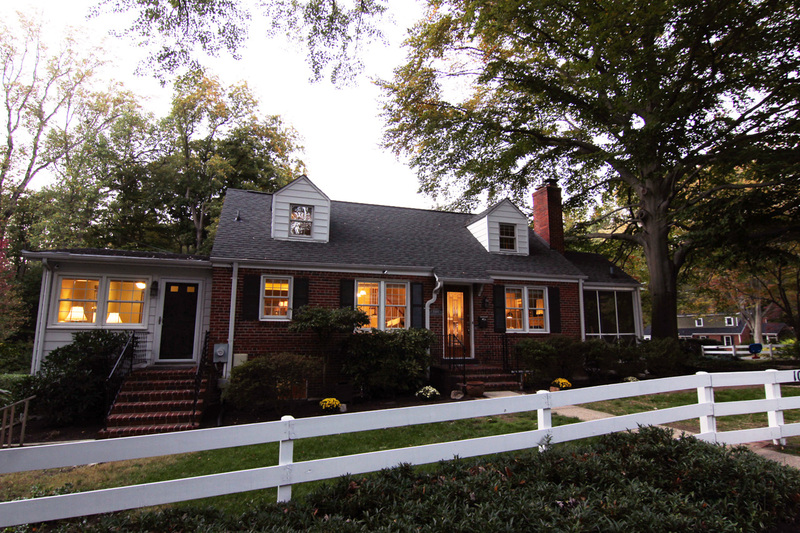 This lovely house at 10406 Brookmoor in the Woodmoor neighborhood of Silver Spring had all the makings of a perfect home, it just needed a little TLC and a kitchen renovation. At DKG we thought this house would be a great way to roll out our new fall color palette and staging inventory, so we had our work cut out for us and not much time to make it happen! Woodmoor is a super family friendly neighborhood and very desirable for young families looking in this part of Montgomery County. We wanted to make sure that the renovations reflected modern updates and improvements but at the same time keep within our budget and time frame. It was important to keep in mind a young family possibly moving into this home like many of the homes in Woodmoor. Because the owners were anxious to get the house on the market, we only had a few weeks to order furniture, get all the work done, stage, photograph and market the home. Luckily for us, the house was vacant and as soon as all the work was decided upon and approved by the owners, we were ready to roll and started right away. The challenge in this house was that the owners are both busy professionals with small children and like most of us had every intention of doing some renovations to make the house more functional for their family and lifestyle. In fact they almost didn’t buy the house because of the kitchen. A while back they had hired an architect who came up with a very expensive and complicated plan for expanding the kitchen. But again, as busy people with little ones, they were overwhelmed by the thought of dealing with a major renovation. That is about the time they decided to sell, and where DKG took over. We were really excited to take on this project and work with the owners who were so open to all of our suggestions and design choices. This made the whole process so easy and fun! From floorings to paint colors and appliances to layout, this house underwent an entire makeover! So many updates and stylish improvements were made to really wow the potential buyers. The biggest question for us was “What to do with the kitchen?”. How can we make it more functional, beautiful and appealing? We decided to recommend a full blown kitchen renovation! When we opened up the kitchen by adding a more open floor plan into the living room, we knew we had made the right decision to knock down that major wall. The kitchen was the biggest project in this house and included the initial demolition, new cabinets, new granite countertops, a breakfast bar, new stainless steel appliances, new hardwood floors and so much more. After the main kitchen demo it was all about choosing new paint colors, refinishing the floors, updating the basement rec room, installing new carpet, doing lots of landscaping and keeping all our amazing contractors, landscapers and cleaners on track to be done on time. Everything fell into place perfectly and the house was soon ready to be staged. The staging for Brookmoor was in the works from the very beginning. We chose the furniture, art, accents, window treatments and more ahead of time so that the final look of the house was tied together by colors, patterns, themes and design. The whole DKG team was excited to fill this home with beautiful furniture and accents to complete the entire project. Before we knew it, Brookmoor was all finished and looking awesome! Check out the property specific website www.10406brookmoor.com for more fabulous pictures and information on this home!